If you love to cook, our Devil Sauce is the key ingredient for the delicious recipes we have created below, and a welcome addition to your pantry to spice up your own favorite dishes. If you see the kitchen as the 7th circle of hell, we've got some quick tips for you too! We'll be adding recipes and ideas frequently, so check back soon! 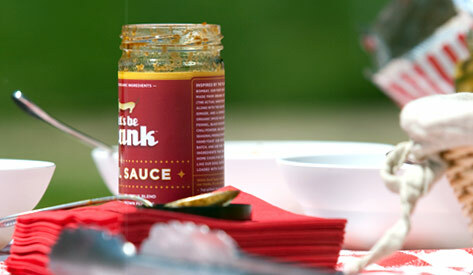 All recipes currently showcasing the versatility of our all-new, very own Devil Sauce! It's so hot right now! Want to get the most out of Frank? In a food processor, purée Devil Sauce, olive oil, garlic, salt, pepper and chili flakes until smooth. With motor running, add butter gradually until blended. Form butter into a log on a piece of plastic wrap; roll up and refrigerate or freeze until firm. To use, unwrap and cut off slices of Devil Butter with a sharp knife. Devil Butter is great on steak, grilled chicken, steamed vegetables, pasta and of course, for making Hell's Chicken, Shrimp Hades or Satanic Chicken Liver Mousse. In a bowl, mix together ground beef, Devil Sauce, 1/2 tablespoon salt and 1/2 teaspoon pepper. Form into a patty and sprinkle with remaining salt and pepper. In a cast iron skillet over medium heat, sauté bacon until crisp; remove bacon and drain on paper towel, leaving fat in skillet. Raise heat under the skillet to medium-high and cook burger to desired doneness (about 8 minutes for rare, 12 minutes for medium), flipping every minute. Place burger on bun and top with bacon. You can add mustard, ketchup or onions, but why would you? It's delicious as it is! In each of 2 large pots, bring 1 gallon water to a boil. Add 1/4 cup salt and the shrimp to one pot; add 1 tablespoon salt and the spaghetti to the other pot, stirring spaghetti during the first few minutes of cooking so that it doesn't stick. Cook shrimp for 2 minutes, drain, peel and cut into bite-size pieces. Put shrimp and Devil Butter in a large bowl. When spaghetti is cooked, drain and toss with shrimp and butter until well mixed; season with salt and pepper. Divide between 2 plates and garnish with cilantro and a few more grinds of pepper. The day before cooking, sprinkle chicken inside and out with salt, chili flakes and black pepper. In a blender or food processor, purée Devil Sauce with 1 tablespoon olive oil and spread over breast and legs of chicken. Cover and refrigerate. Two hours before cooking, remove chicken from refrigerator and drizzle with 1 tablespoon olive oil. Place chicken, breast side up, on a rack in a roasting pan; place 3 tablespoons olive oil in bottom of roasting pan. Pre-heat oven to 475°F. Roast chicken for 40 minutes, rotating pan 90 degrees and basting every 10 minutes. After 40 minutes, turn oven temperature down to 375°F. Turn chicken over onto breast side and roast for 10 minutes more, or until juices run clear when thigh is pricked with a small, sharp knife. Carefully tilt chicken so that its juices drain into a small saucepan. Add stock to saucepan and bring to a simmer. Let chicken rest about 5 minutes, cut into 8 pieces and arrange on a platter. Whisk Devil Butter into stock until creamy, pour over chicken and serve immediately. Quick and easy tips for when magic must happen fast! If you find cooking for guests a nightmare inducing experience, our Devil Sauce can be your apprentice in the kitchen, turning you into a wizard. You will find that when your jar of Devil Sauce has been resting, a small amount of oil will rise to the top. You can either stir in the oil or use just the oil, as in this recipe. Cut onion into 1/2 slices horizontal to root.